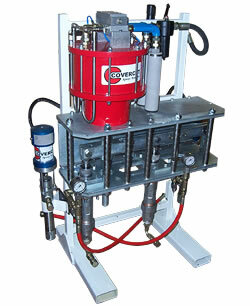 Covercat now offers a fixed spray machine with a simple mechanical adjustable ratio yoke system. The ratio is fixed at all times during use and so provides accurate ratio control without the concern of any electronic or sliding scale adjustment. To change ratio between products simply release a clamp screw and move the pump to the correct pin located position and tighten the clamp screw. This means that operator error and other factors are virtually eliminated and a simple ratio test allows the system to be prepared for any new product. Pressure Output up to 5500 psi (360 bar) and delivery to 1.25 gallons (6 litres) / minute are achievable at normal stroke rates.